Not everyone knows how to make the perfect cup of loose leaf tea, and this article provides guidelines to enjoy loose leaf tea to its fullest. Water temperature, quantity of tea leaves and steeping time are all important factors. Let’s not forget that it’s ok for every tea lovers to prepare their loose leaf tea to their own personal taste. A proper preparation can maximize the flavor and health benefits of loose leaf tea. Below are recommendations to enjoy your loose leaf tea optimally. Note: When using quality loose leaf tea, it is not recommend adding sugar, lemon or milk, which would mask their subtleties and delicate characteristics. The British almost invariably add milk and sugar to tea because often tea contained in traditional tea bags isn’t the best quality, so sweetening it is needed to mask the bitter flavor. Milk will actually eliminate the antioxidant properties of loose leaf teas. 1. Bring more than enough water to boil in a non-reactive (enamel, glass, or stainless steel) tea kettle. A cup of tea is about 99% water. The better your water, the better your tea. The best water is filtered or bottled (but not distilled), although bottled water is not the best choice for sustainability. Tap water is not recommended unless a city’s water quality is ascertained. If using tap water, let it run cold for 10 seconds before using it for tea. 2. Pre-heat the drinking cup or teapot (if used). This will prevent the steeping water from dropping in temperature as soon as it is poured into the cup or teapot. Add a little boiling water to a ceramic or porcelain tea pot or the individual cups or glasses (wherever the tea will be steeped - (ceramic and porcelain retain heat well). If using a tea pot, cover with the lid. Let stand for about 30 seconds until the vessel (cups or tea pot) is warm, then pour out the water and proceed immediately to the next step. 3. Put the loose tea leaves into an infuser, strainer, paper filter or directly in the bottom of the tea pot. Steeping without an infuser or strainer gives the tea more room to unfold and release additional flavor. Letting the leaves steep for too long can make the tea bitter. 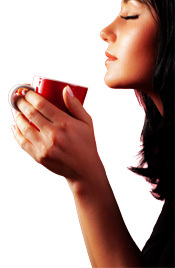 Using water that is too hot can also affect the taste, as it can burn certain tea types. When washing your teapot, avoid using soap as it could affect the taste of your tea. Just use warm water and a soft brush instead. 4. Start with one heaping teaspoon per cup of tea to be made, unless you have instructions which suggest otherwise. The amount of loose tea used will depend on the type and strength of the tea, as well as your individual taste. Fluffier tea leaves will require a heaping teaspoon, whereas a compact or smaller leaves would require a level teaspoon. 5. Pour hot water over the tea. Use an amount in proportion to the quantity of tea you've added (e.g. 4 cups of water for 4 teaspoons of loose leaf tea). The ideal water temperature varies based on the type of tea being steeped. The more oxidized and fermented the tea (e.g. black tea), the hotter the water should be, whereas less oxidized teas (white, green) should be steeped in water that isn't as hot and well below boiling: 170-185 F or 76-85 C. For black teas (full leaf), the water must be at a rolling boil (212 F or 100 C) and then pour immediately over leaves. The most common mistake is to steep black tea with water that is not hot enough, which can prevent the active substances in black tea from developing fully. 7. Remove the tea leaves from the pot or cup. Remove infuser or pour the liquid into another vessel through a strainer to catch tea leaves. If using a tea pot, place it back under tea cozy if there is tea remaining in the pot after serving, as this helps keep the tea hot longer. Many teas, especially green tea, oolong tea and pu-erh teas, can be infused multiple times. Therefore the above steps may be repeated multiple times, increasing the steeping time with each infusion, to maximize your tea leaves. In some Chinese traditions, the tea is first steeped for 15-30 seconds to rinse the leaves and also allow them to begin opening, and the resulting liquid is poured off and used to rinse any cups and utensils used in the following steepings that are consumed. This process also eliminates a good part of the caffeine contained in tea, because caffeine is water soluble. We do not recommend serving loose leaf tea with milk, sugar, lemon or honey. Loose leaf teas are delicious without adding these items, and doing so will degrade the benefits of any herbal ingredients, read our article about chamomile tea benefits. However if you do add them, it is best not to add both lemon and milk, as this will cause the milk to curdle. If you use milk, add the milk to the cup first and then add the tea; this prevents the hot tea from scalding the milk by heating it gradually. 9. Let sit 6 minutes before drinking. Scientists have discovered that the key to the best tasting brew is to let it sit for six minutes before drinking. Not only does it avoid scalding, but it allows the tea to cool to about 140F or 60C, which is the optimum temperature to release the most flavors. 10. Enjoy your perfect cup of loose leaf tea!